Always In My Heart Key Chain. Help us get to know you better. Introduce yourself and tell us a little about yourself and your dogs. Share your suggestions and comments. Help make this a better board. Share with everyone your favorite dog related websites, internet links, books & videos. Know of an upcoming dog event? Let the rest of us know. Post it here. We'd love to see pictures of you and your dog. Please share them with us. Post interesting pictures and video that are NOT of your dog or family. Have a little fun with those pictures. Enter them in our monthly contest! Active Monthly and Special Photo Contests are here. General questions and info on the breed. The place to post questions about whether the GSD is a good fit for you. Need help deciding between Shelter, Rescue or Breeder? Puppy, adult or adolescent? Male or female? Type and bloodlines? Ask here! The basic puppy training & behavior. Wondering how to housebreak? How to socialize? If it’s normal for your puppy to do something? Ask here. What do you feed a GSD puppy? Ask your questions about those goofy GSD ears, how much should my puppy weigh and anything else relating to their development here. Selzer --Quinny & Pup Update? Having issues with your critters getting along? Need some help? Can’t figure out where to post your question? If your question doesn’t fit elsewhere, post it here. What should I teach my GSD and how do I do it? Should I take classes, or do it myself? Discussion of different training theories and methods, and what training equipment to use and how to use it. 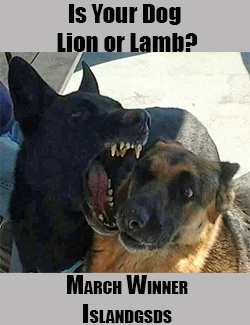 Having behavioral problems or training issues with your GSD? Get help here! How to find a good trainer. Recommendations of books, videos, websites and other resources for training info. Your resource for all things Senior; health, behavioral or just a sounding board. Health Topics relating to our older dogs. Behavioral questions, where to find best equipment for my senior, I need a shoulder to lean on. This is a good but hard section of the board to read and post in. BUT we feel that it important to have resources and support when you need it most. Post a tribute to your GSD who has gone to the bridge. It’s tough; maybe we can help each other. I am a lucky dog that has been Rescued. Follow my New Journey to find my forever family and home. Questions and discussions about rescuing, fostering & adoptions. Discussion of GSD bloodlines & pedigrees. Discussions, questions & comments relating to canine genetics. Diluted GSD or GSD/husky mix? This area includes dock diving, flyball, triebball, lure coursing, skijouring, hiking, any other miscellaneous dog sport not listed elsewhere on the forums. SAR, Guide, Service, Therapy, Military, Police K-9s and all other working dogs not listed elsewhere on these forums. Anyone know about this orginzation, K9's4COPs? Dad always said not to discuss politics or religion, so NO political, religious or controversial topics please. Please post your dog posts in the appropriate dog forum.